Mark your calendars for this year's Fort Thomas Pumpkin Walk, Friday, October 26. from 6:00 to 9:00 p.m. The trail starts at the Tower Park Tennis Courts. It's free and includes some family photos. New this year, the Fort Thomas Recreation Department will show the movie, Hocus Pocus in the amphitheater at 830 p.m.
Family carving night will take place Wednesday October 24th. 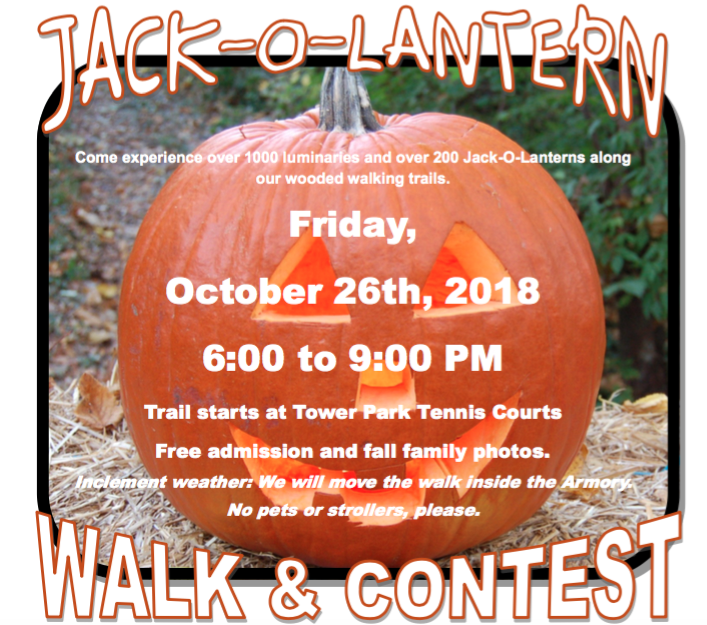 The Recreation Department will provide tools, pumpkins, and pizza. That event starts at 330 p.m. until all pumpkins are carved. Children under 15 must be accompanied by and adult. New category in the contest this year is the preschool division, for uncarved pumpkins, allowing for children too young to carve to still participate. Stickers, paint, etc. There will be golden pumpkin trophies for all of the winners. Other traditional categories include Scary, Traditional, Cutest, Creative, Characters/Faces, Themes & Scenes and Everything.